A few weeks ago I attended a workshop focused on making games for libraries run by Andy Walsh. The idea behind the workshop is to produce games used for information literacy instruction. As I am running a session at PI and Mash in August to introduce people to the Pocket Code programming environment and give them ideas for producing a library game, I thought it would be a good opportunity to get a bit more focused. The workshop gave us a brief introduction to different types of games that we could make; the tools you can use and game design, concepts, mechanics, goals/aims and rules; and how to progress through the design stages logically. Andy provided a range of materials eg blank cards; dice; spinners; pens; blank boards, etc and we were split into small groups to actually prototype a game. I thought this was a tall order for a 4 hours session, but all of the groups managed it. It seemed as if you kept the end focus in sight it was a lot easier than I expected. As an aside, this is something I’ll be keeping in mind when I’m creating my little computer games, as they tend to go off in random directions. My group created a prototype for a classification based card game. The end goal being something that would improve people’s understanding of classification. It was called “Dewey or Die” and was based around the idea of collecting a set or run of similar Dewey classification playing cards. This video explains the rules. 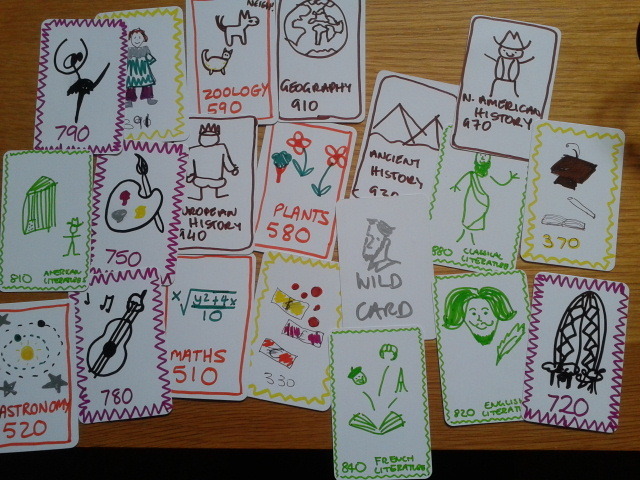 Here are the prototype set of lovingly created hand-drawn cards (possibly a collectors edition in future). There were 5 games prototyped during the workshop and it was interesting to see the areas the other teams focused on and how they put their games together. They can all be found on Andy’s Making Games in Libraries blog. I found the workshop enjoyable and fun and the ideas behind it are something I’ll be using in future.